According to its title this disc is devoted to battle music, a genre which was very popular in the 16th and 17th centuries. The programme offers a number of pieces which, in one way or another, are connected to war and military battles. The large repertoire of this genre can be explained by the fact that war was a part of everyday life in those days - and in many parts of the world still is. According to the Prussian military thinker Carl von Clausewitz (1780-1831) "war is merely the continuation of policy by other means" (Vom Kriege [On War], 1832). That was certainly true in the 16th and 17th centuries. War was such a natural phenomenon that it was also used metaphorically for other �battles�, including those of love and faith. Notwithstanding the disc�s title its programme presents music only some of which is related to war. Although the booklet doesn't contain lyrics, it is difficult to see what a chanson like 'J'ai vu le cerf du bois sailly' has to do with war, and Lassus's Marian motet 'Fit Porta Christi pervia' certainly hasn't. As the tracklists show, a number of pieces date from the 16th century and can't be considered 'baroque'. What this recording is all about is to present music composed for wind bands, which were the most popular kind of ensembles in those days. There were two types. On the one hand the 'piffari', as they were called in Italy, or 'waits' in England and 'Stadtpfeifer' in Germany. They usually played at festive occasions in towns and also entertained the citizens, for instance during weddings. They used instruments like shawms, sackbuts (trombones) and bagpipes. Their music was written out and mostly polyphonic. 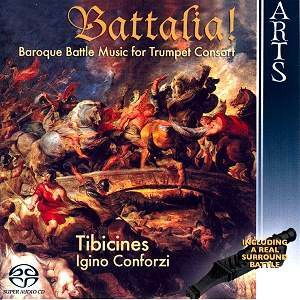 Another kind of wind band was that of the 'trombetti', an ensemble of clarino trumpets used at court. The players were highly sophisticated and most of their - often very virtuosic - repertoire was only partially notated and needed improvised additions during performance. The players were also able to play ad hoc arrangements of traditional pieces. According to Igino Conforzi there is evidence that these two kinds of ensemble played at the same time on certain occasions, although there is no proof that they actually played together. There is no information about the kind of repertoire they could have played. This makes the concept of this disc all rather speculative. I find it difficult to imagine that the clarino trumpeters at court would have participated in the performance of 'popular' music, like the dances by Attaignant and Susato. The suggestion also creates technical problems as the clarino trumpets are not able to play all notes as notated. I also find it hard to believe that the 'piffari' would have been involved in pieces like those by Fantini, where the word 'imperiale' - which shouldn't be taken too literally, by the way - clearly links them to royal courts. Even so, I have thoroughly enjoyed this recording: the programme is well-chosen, the pieces for a band of clarino trumpets are very intriguing and fascinating, and give a very good idea of the development of the art of clarino playing. Many live performances and recordings show how difficult it is for today's performers to come up to the same level as their 17th-century counterparts. Therefore I am very impressed by the performances here. I would like to know, however, whether any technical adaptations have been made in order to improve the stability of intonation, which is quite impressive. The booklet is silent about that. The disc ends in a quite spectacular way with music from different sources to accompany the sounds of guns and cannons, all 'period instruments' of course. Even though one has to realise that this kind of battle was a harsh reality in the 16th and 17th centuries it remains great fun to listen to.